As you know, from this post, we have had a Tile for bit now. Honestly I feel like I need at least 10. I’m such a forgetful person, some call it mom brain. Beyond being forgetful, we take holiday stuff out 1 time a year…so everyone is bound to be forgetful. We need a Tile for when we pack up our holiday gear. 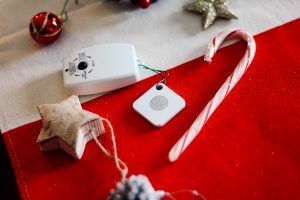 Have you ever gone to open the tree or lights with a remote and the remote is no where to be found? Okay here are some tips for those forgetful! We have a “fake tree”. 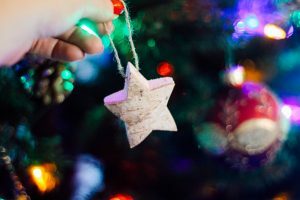 Bring on the eye rolls, but honestly between having a dog who may try to eat it, the ease of putting it up and taking it down and having a toddler who would definitely pull it apart… this is working for us. The tree comes with a remote for the lights along with a few other holiday decor pieces we have. So we put them all in a big plastic bag together so the tiny removes don’t get lost. We now keep all our remotes in one of the built in cabinets of our living room. As I stated above, they are all in a big plastic bag. I keep some stored decor in this cabinet so as season change things move around. No matter how I move some of the stored items in that built in, we will easily find that bag because Tile is in there to help. 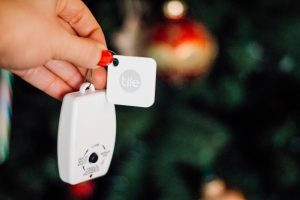 I’m not even worried if my husband accidentally puts it in a bin in the garage, because thanks to Tile I’ll find it.With a a few simple clicks on my phone and off to the Tile app I can easily find my Tile and the items it’s with. The Tile sets off a little tune so you can follow your ear to find the Tile. If you know someone who is forgetful the Tile is an amazing gift! I also use a Tile on my camera since I use it and set it down in the house… then can’t find it. It’s also great for anyone who misplaces their wallet or keys. Specifically pack all tree decor in one box and all nutcrackers for example in it’s own box. Then when you are unpacking you will know you finished all of the tree ornaments or you have found all of your nutcrackers for placing around the house. Keep the outside lights separated from the indoor lights. No one wants to open holiday bins to find they indoor and outdoor lights are all mixed up. That’s giving me a headache thinking about it. 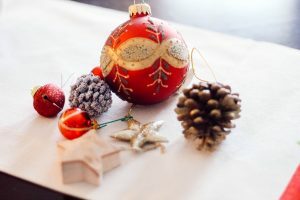 I hope you found this helpful and this makes opening holiday decor next year much easier!